AMNH Research Library | Digital Special Collections | Mon-Chonsia, a Kansas chief, White Plume (Kansa), portrait from Thomas Loraine McKenney's "History of the Indian tribes of North America"
Mon-Chonsia, a Kansas chief, White Plume (Kansa), portrait from Thomas Loraine McKenney's "History of the Indian tribes of North America"
“Mon-Chonsia, a Kansas chief, White Plume (Kansa), portrait from Thomas Loraine McKenney's "History of the Indian tribes of North America",” AMNH Research Library | Digital Special Collections, accessed April 24, 2019, http://lbry-web-007.amnh.org/digital/index.php/items/show/18635. 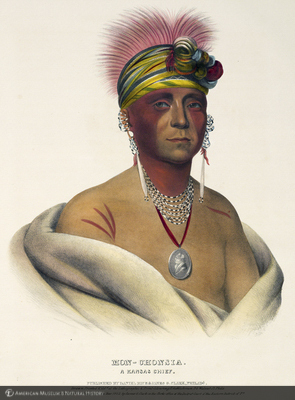 AMNH Library catalog record: History of the Indian tribes of North America, with biographical sketches and anecdotes of the principal chiefs : embellished with one hundred and twenty portraits, from the Indian gallery in the Department of War, at Washington / by Thomas L. M'Kenney and James Hall. McKenney, Thomas Loraine, 1785-1859. History of the Indian tribes of North America, with biographical sketches and anecdotes of the principal chiefs :embellished with one hundred and twenty portraits, from the Indian gallery in the Department of War, at Washington. Philadelphia : E.C. Biddle, 1837-1844.